Washington State Earth_Month Proclamation, We're In! 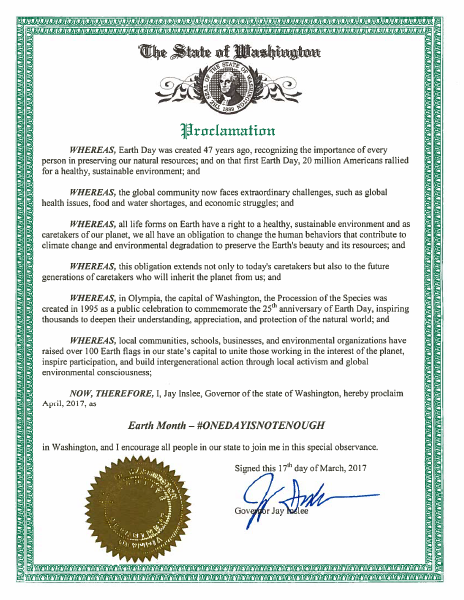 The official Washington State Earth Day Proclamation signed by Governor Inslee has just been made public. The Proclamation is actually based on the several Earth Day Proclamations the Procession has received from previous Thurston County Commissioners (Sandra Romero, Karen Valenzuela, Cathy Wolfe) and to whom we owe much gratitude for their many years of service on behalf of environmental quality in Thurston County. Last year, when long-time Procession Production Crew member Dave Sederberg and his daughter Whitney initiated an Earth Month Campaign with their motto "Earth Month #One Day Is Not Enough", they re-fashioned a similar proclamation that was adopted by the Olympia City Council. This year, Dave and Whitney took their Earth Day Proclamation - and the official raising of an Earth Flag on the Capitol grounds! - all the way to Governor's desk. In every rendition of these Proclamations, recognition of the Procession has remained as a core element and honor. The Earth Month Campaign invites all environmentally committed citizens and organizations to celebrate the raising of the Earth Flag on the Capitol Campus, Saturday, April 1st, 2:15 on the Capitol Steps. The Governor's Proclamation will be read aloud. Samba Olywa will be there to lead us in a short Procession around the Capitol grounds oval. Take a read; the Proclamation is attached. Proud hearts in each of us who have carried this expression called "Procession" into the future for the past 22 years. Congratulations Everyone - We are Procession!